These don't come along often, so I thought it'd be worthy of a thread as I go through and test/repair various bits. 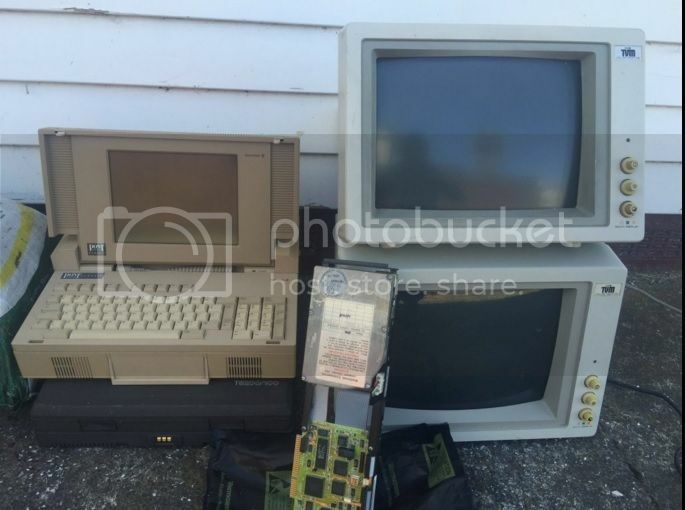 It all started with a trademe pickup, for an almost complete collection of NZ PC World's for $1 - but even on that day I was given two fantastic mid-1980's era enthusiast books and a Zenith Z183 dual 720KB laptop. The Zenith worked fine, in fact the original battery actually still maintains a charge! I unplugged it from the wall and it kept running. The biggest trick in getting it running was working out the polarity of the power connector - it's reverse with a centre negative. Anything from 12V up will get the system started but 16-18 is ideal for charging the battery properly. I also gave it a cleanout. I returned this weekend with more than $1 on me this time, to purchase some more items I had eyed up and ended up going home with a full car. As far as I'm aware, this is the only computer they ever made. 360KB floppy, no printer option installed, 512KB, Plasma CGA - after cleaning the disk drive, it works a treat. Had a stuck hard drive, which was removed and gently encouraged to spin (quick tap with the handle of a screwdriver on the side of the drive) - it now READS reliably and actually booted up DOS 5 and in to Windows 3.1 [which had the PC Speaker sound drive enabled - which worked better than I expected!] - however writes are hit and miss, so I'll need to determine if it's cable, oxidization, or a bad drive. Needs a CMOS battery too, but that takes 5 minutes. I've got spare Conner CP344, CP3000, CP3044 etc, but not sure if I have a CP3104 spare - I may end up fitting another model drive in it and using software to get around the BIOS limitation but hopefully it's just a cable issue. Proper CGA displays with DE9 connectors and that dark black tube you'd see on monitors like IBM's 5153. It's hard to tell in the photo, but in a normal inside environment it's a very rich black and looks great when used. Both of them run perfectly with no jitter or issues and are in surprisingly good condition. I'm not sure if it's 20 or 30MB but it's in very good cosmetic condition. Owner asked specifically to know how I got on with this part, so I'll try this out soon. Bag 3: only 1/3 full, but contained hard drives, including an ST225 that still boots! Not to mention the piles of IO cards and various combinations, modems, sound cards (Creative, ESS, Yamaha OPL) network cards, and PCI cards (S3 Stealth 64 etc). Others: At least 10-15 boxes of DSDD 5.25" disks sealed, 720KB x 1 box sealed, a few DSHD boxes sealed. Power adapters. Around 20 CPU's - mostly 486, some Pentium, one 6x86. Memory modules, enough to half fill a motherboard sized static bag. For a PC collector, it's like Christmas morning when you're 8. P.S. 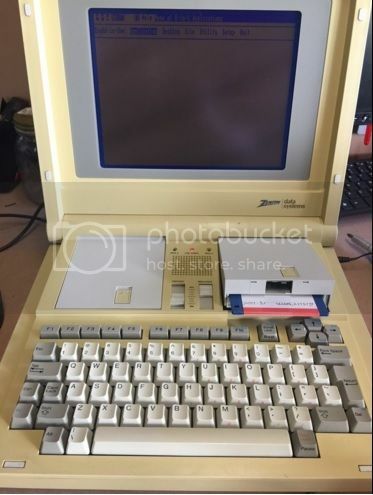 he also has a a ZX81 in poly (no outer box) with an aftermarket keyboard attached, I believe he's intending to list it on trademe at some point, I knew I wasn't going to offer a fair value for it because it's not what I collect, but it is there. Congrats and thanks for rescuing it all from destruction. Nice Jono and well-rescued. Where do you manage to keep all this stuff though?? tezza wrote: Nice Jono and well-rescued. Where do you manage to keep all this stuff though?? Well it wasn't an issue once, but it's certainly an issue now. We recently had to free up a bedroom, so my available space was reduced. 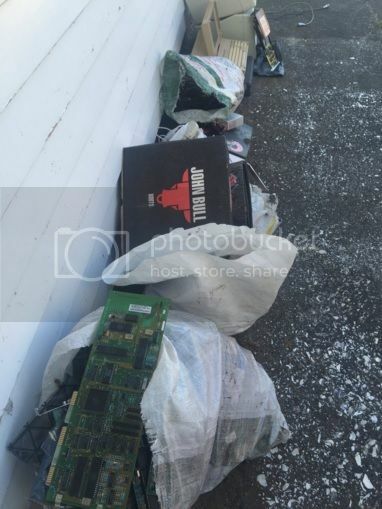 Inside and permanently setup are: Tandy 1000 TL/2, PC, PC XT 256, PC XT 640, PC JX, RT, 486DX2 [games etc], P2 350 [games etc]. Portables are lined up neatly under desks, ready to pull out at any time. Parts are kept in containers, or drawers - but this new pile needs a storage solution. Anything else is generally in my storage unit right at the moment (well ventilated, secured etc), or in m garage when I'm working on it. With the storage unit I manage that by doing a 'trade' system - if I want a computer, I have to drop off a computer, helps keep the local population down. In two weeks I'll have permanent power in the garage, and with some insulation and a bit of home DIY and even the help of some old KVMs - I have great plans for that. I'd love to be able to afford a larger dedicated location, but I don't see that happening any time soon. Looks like quiet a find. Was that all through a private seller on Trade Me or is it a company off loading a lot of stuff? Just been fighting with the T5200/100. Hard drive still has problems writing. Machine refuses to work with any hard drive other than the models it was intended to - basically Conner CP series 40 or 100MB. I attached a CP344 from a T3200SX, and it auto detected the drive no problem without error. However that drive is not only too small for a T5200/100 (bit of a downgrade) but the machine refuses to boot from it - "Missing operating system" - however I can boot from floppy and read/write to it no problem - done FDISK /MBR and reformatted it fresh. Also tried a Conner 84MB and 170MB, both CP series, wasn't interested. Didn't show a liking to any of the Seagate's I attached either. I think my next step is I'll either make it a SCSI machine, or set the drive to None and use an XTIDE ROM. Probably get to it later in the week. Despite old newsgroup posts indicating otherwise, it seems modifying the drive table on the original BIOS will not get past the "only approved drives" type code. It was outraged by my CP30174E despite being a working CP drive with the exact CHS paramters available in the drive table. On the bright side, I now know how to edit the drive table on AT based computers - so if I want to run a drive with say 33 sectors per track on a 286 with no user type - it's not an issue now. I'll no doubt write it up at some stage, but if anyone here is genuinely interested I'll pop it in this thread. I've left my thread on VCF open, in case somebody works out some kind of magic trick, but for the meantime I'm just going to use an XTIDE ROM. So I'll get that sorted today and throw in a new battery while I'm there. 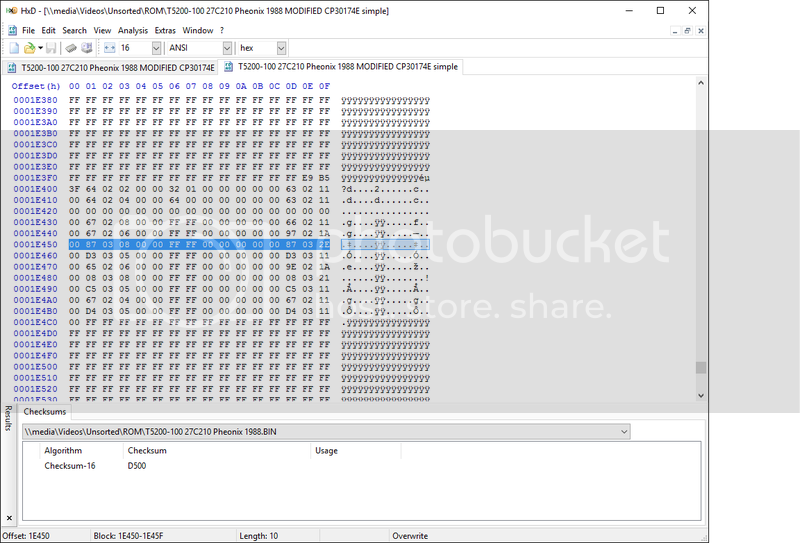 Discovered my HP 286 bits are from an original Vectra. One of the ST225's booted in to MS DOS, despite being outside for quite a while. Many of the cards, and even that ST225, have bad oxidisation from the elements and needed their edges cleaned. tezza - a while ago you gave me a 286 motherboard with an excellent BIOS which I loved, but I couldn't work out what case I wanted to use it with. I've had this Unitron case that I was going to use for a 386, but I opened a copy of NZ PC World ~1990 and on the second page there it was for $1995 - Unitron 286-12! So it's getting a proper home now. Edit: Finished the T5200/100 - XTIDE 1.15 in a Racal Interlan 8 bit NIC, BIOS set to No Drive, 170MB Conner, new Tardan 3.6V lithium (exact OEM replacement in original holder) fitted - boots MS DOS 6.22, just need to put some real software on it. Nice haul there Johnno. Well Done. Quick update, Miniscribe 80SC Hard Card works. It's 30MB RLL. Was rather interesting, it made very bad noises - head slamming the side of the drive etc - and I was goofing around trying to get the system it was in to boot from floppy when all of sudden it booted in to MS DOS. I'd estimate it took about 6 power ons, but it eventually made it. Seek errors and failures ensued, however after an hour or so of running, it now sounds perfect and I was able to complete a low level format no problem. I think it'd just been sitting for too long. Dates on the files indicate it was in use in 1988 and 1989 but not much after that. On boot it loaded some very very old Phillips CDROM drivers including a Phillips MSCDEX (not Microsoft) which I was able to recover 90% of and transfer over to a laptop. There was also a tool that apparently allowed you to "Prepare a Phillips P31000 drive for use on a Western Digital Controller" - so I'm not sure if that's for something else, or if this was removed from a full Phillips machine and they were calling the hardcard as Phillips product - no idea - I just used debug c800:5 anyway. If anyone had/has a Phillips XT or 286 I'd be curious to know what drives they fitted. I've also tested the HD FDC cards for an XT, and succesfully booted MS DOS 6.22 off a 1.44MB floppy - so I'm quite happy with that. I intend to read the ROMs and pop them up on the interwebs when I get a chance. 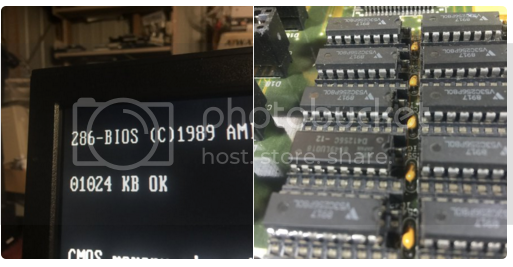 Compaq 1988 IO card blew out two caps, actually got the second one on camera, the third I removed as a preventative measure - still worked at 115,200 baud afterwards! Unrelated to this haul, I also got a clone machine recently which is a non-starter (even the Supersoft/Landmark ROMs will not boot), it's identical to a working model I have and all chips are socketed - so I'm slowly swapping chips over until I find the culprit - very cheeky manufacturer, the on board ROMs contained MS BASIC and the BIOS used in the IBM 5160 - didn't even bother to change the copyright message in it - they just burned it to some 2764 Mitsubishi EPROM's and called it a day. Edit: Floppy Disks - Verbatim spare floating disks look OK but there is only 1 sealed pack.Most will probably end up as "artistic use only". I've opened 3 sealed boxes of the Bonus brand media - all ten disks in each pack unusable. Worth noting if people are bidding on this brand in the future - I'll be sticking with my "new but from China" DSDD media - works out at around $1/disk and they work well.